Based on the number of complaints regarding non responsiveness to customer complaints, scamFRAUDalert see it appropriate to issue this ALERT. SafeCart which claim to be one of the Internet’s leading payment processing services, provide do not answer their phones or provide a means to resolving complaints. Consumer have also reported of numerous unauthorized ACH transactions to their bank or credit cards accounts. 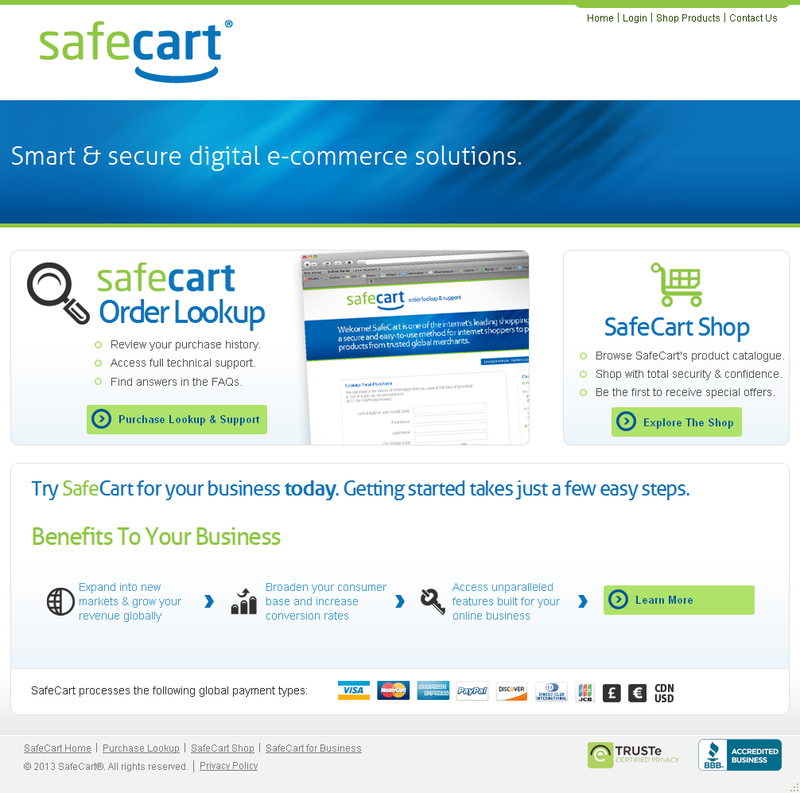 SafeCart is one of the Internet’s leading payment processing services. We are sorry to hear of any problems you have encountered with your transaction/purchase, and please understand that we do take your complaint seriously. In regards to your complaint, please contact us at SafeCart, and we will be more than happy to assist you. You can reach our customer service at 1-855-432-0727 (M-F 6am to 5pm PST) or through email at customerservice@safecart.com. 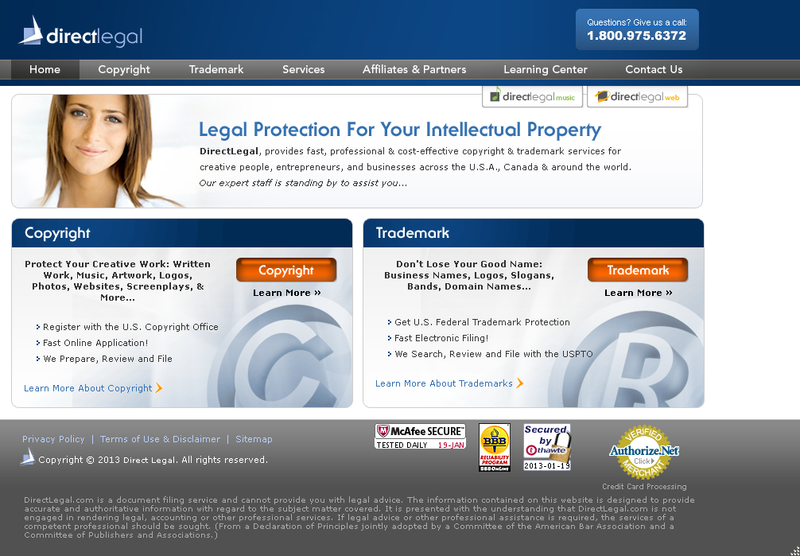 scamFRAUDalert see it appropriate to issue this ALERT as consumers have complained that they had paid for copyright or trademark services and such services were never provided. The Better Business Bureau of Greater Los Angeles list the address to be in Century City and the owner to be one Lorne Eisenstat, J.D. The website list the addresses below. American Careers ~ Maryland/Washington, D.C.
scamFRAUDalert see it appropriate to issue this ALERT as job seekers have complained that America Careers of Baltimore, Maryland and Metro Washington D.C. area advertise non existent jobs and required an upfront fees of $39.00 for services provided. interviews for the Applicant as we possibly can. The $39 one-time fee we charge is refundable in the event we are unable to obtain employment for the Applicant. Details are included in the paperwork the Applicant receives. This is a vast amount of information & assistance which could potentially require many hours to perform individually. As far as the consumers that we have helped it is up to them if they choose to post positive responses. Our main goal is to help our consumers. That includes you. I am here to help you to follow your dreams of an airline career. Again, please call me. Our potential employees can find more information regarding the position extended in this letter. – Regular bank account or Verified Business/Premier PayPal account. – Salary plus additional commission. If you have Verified Business/Premier PayPal account – earn 10 commission! Receive a $400 “Sign On Bonus” by submitting the necessary paperwork by the end of the week! Apply online by the end of this week and receive a $400 start-up Bonus. If you are interested in the services offered by the SERVICED CONSULTING LTD and you would like to become our client, please contact the nearest representative of SERVICED CONSULTING LTD in your region. Please direct all your propositions concerning cooperation and use of our services to the following e-mail: support@servicedconsulting.net. The Financial Services Officer will process payments coming directly from our employees, and is expected to demonstrate precise attention to detail and to process their designated payments according to a strict but easy-to-follow step-by-step protocol consisting of both written directions and verbal instruction and coaching from the supervisor. A more defined, complete, and all-encompassing set of rules will be provided upon commencement of paid training, during which you can ask your personal supervisor any pertinent questions (whether specifically rule-driven or more general in nature) prior to finishing the process. SERVICED CONSULTING LTD will provide detailed instructions with regards to payment processing procedures and details, including the sender’s full name, total amount being processed, invoice and check numbers, internal company codes, and a host of other private details for each separate payment. Note that not only do legal and ethical standards apply at each step of processing, but the correct processing and documentation of payments is the main method by which we determine your commission bonuses, so it’s in your best interest as well as ours that this processing is performed as accurately as possible. When funds enter the bank account that our employee has designated for work purposes (see FAQ), the Financial Services Officer’s duty is to withdraw the correct amount of cash payment (minus commission), transfer the funds using an International Wire System, and make a correct and materially accurate notation of all relevant details, including names, numbers, amounts, times, and other details about the payment, according to an electronic form which they will receive. For agents utilizing their Verified Premier or Business PayPal account, we offer a slightly higher commission of 10%. The primary advantage that our Company and our agents enjoy over our competitors is maintaining the absolute shortest possible time within which our seller or other clients can receive money for the goods and/or services that they have already provided, by using our proprietary distributed payment processing protocol. If this operation is delayed for whatever reason, our clients are inconvenienced and subsequently entitled, according to the agreement we’ve signed with them, to withhold pay from our Company for that project-in this case you, the Agent would still be paid your base salary, but would risk commission on that particular processed payment if it was found to be processed erroneously. An agent’s failure to process correctly or in a timely manner cuts into our payment conversion rate, which currently sits comfortably close to 100%. If repetitive mistakes occur, the client may even cancel their contract, resulting in financial loss and loss of esteem/reputation of our company, which will reflect in future losses if we don’t keep our rate of errors low. As a new hire, it is best for you to worry about accuracy first and then volume once you’ve successfully transferred your first couple of payments and are confident that you have mastered each step of the processing procedure so that you can eventually gather some speed. In other words, crawl before you walk, and walk before you run – there will be plenty of time for you to learn, and in the meantime your personal supervisor is there to guide you each step of the way. HINTS & TIPS: If you are a qualified owner of an account with HSBC Bank, you will instantly receive more transfers and pay! HSBC Bank is one of the largest banks in the world and is preferred by our clients! Financial Services Officers receive detailed invoices for each transaction every 14 days. This document will serve as confirmation of transaction validity and in case of any (if any at all) unforeseen circumstances, it will evidence your personal non-participation. All invoices will contain detailed information on money sender and will be both sealed and certified with our President’s signature. Since business transfers can sometimes incur delays, Financial Services Officers should specify each transfer as a “private” transaction. This provision is also applicable in case of a third party interest in the transfer. (For details, ask your personal supervisor). Our clients appreciate our unique methodology and operational efficiency and are ready to pay a premium fee for shorter transaction terms. If we manage to deliver goods to the buyer within 5 days, the deal is considered to be fulfilled at the earliest possible date. All the fees (WU/MG) are paid from employee’s commission. HOWEVER, our company undertakes to reimburse part of any expenses which are incurred in connection with money transfer (WIRE for Tier 2 employees, or by Western Union/Money gram system for regular Financial Services Officers) should money transfer charges exceed 3%. All in all, your net profit will amount to 8% (5-8% for Tier 2 due to high sums) of the total amount of each payment processing operation. We don’t and never will ask for any investment of your own funds at ANY stage of the process. Successful applicants are offered this position on a probationary period, which is to last 1 (one) month. During this period, an employee will ‘learn while they earn’, training and receiving online support, phoning their supervisor with questions, comments and feedback, and learning different aspects of the position at each juncture, all while earning their base salary. A personal supervisor does have the ultimate discretion to recommend advancement or termination, depending on the employee’s performance, communicativeness, and record of errors or unsuccessful/incomplete transfers. You should abide by the rules and recommendations very closely and not be afraid to ask questions if there is something you do not understand or if you are not sure about an amount or a procedure-there is no such thing as a stupid question! Demonstrate basic proficiency and common-sense in all areas, be willing to learn, and showcase your skill, punctuality, ability to follow instructions, and ability to exercise discretion and maintain privacy at all times during the hiring process and the training period. Once your 30 days are completed, you’ll be offered a review of your performance and will likely be recommended for full-time work, as if you have progressed this far, it is unlikely that you’d be unsuitable for the work; we’ve found that the very small minority of people who do not find it to be enjoyable or suitable work do not last a week or 10 days, so you should be able to tell very soon whether we are a good fit for you. Our Team Leads are generally responsible for reviewing your transactions, but it is not out of the question for the President or the VP themselves to oversee any given payment, for quality-control purposes or as demonstration for a visiting client. Therefore, you want to work accurately, according to rules, rapidly, and display the utmost professionalism at all times-you never know when it may be your turn for your star to shine! During the probationary period we offer £1,500 monthly salary plus 8% commission for each payment processing operation. For example, an average £5,000 payment will entail £400 commission (but WU/MG fee is paid from this money, please see below for more details). Furthermore, we offer £50 bonus for each transaction completed by 11 o’clock (local time). With the current number of clients, on average, your overall income will amount to up to £4,000 per month. A successful agent may ask for additional tasks and earn more. After the probationary period, base salary goes up to £1,800 per month plus 8% commission. Base salary (£1,500) will be transferred at the end of the month to employee’s bank account via Direct Deposit. Commission (8%) is to be deducted from the processed money at the time of the transfer. SERVICED CONSULTING LTD pride ourselves on being a company which complies not only with all standard accepted industry rules, regulations, codes of conduct and ethical practices, but also in maintaining strict obedience to the letter and spirit of the law, keeping careful records and ensuring our clients the legality of their transactions as well as the safety, confidentiality, ease and speed for which we are known in the Payment Processing industry. We are an Equal Opportunity Employer and do not discriminate based on race, gender, color, religion, creed, sexual orientation, or political belief. 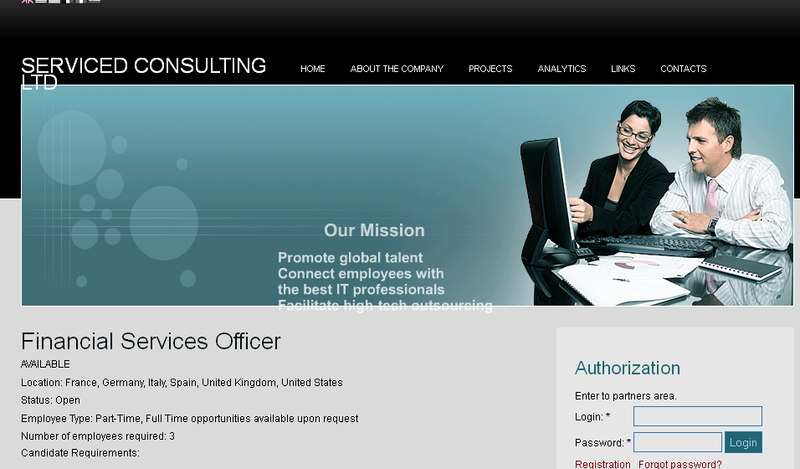 I’m very interested in your offer and would like to know more about the Financial Services Officer position. It is not clear why you need Financial Services Officers. Isn’t it easier to make direct transfers? Is SERVICED CONSULTING LTD ok with having just a read-only access to my bank account?